Guild Wars is an advanced Guild functionality available from Guild Level 12 to Guild Leaders and Guild Officials. As a regular guild member you only need to make sure your team is always active when the season is approaching. Idle Heroes Strategy Game Guide. Guild Wars is an advanced Guild functionality available from Guild Level 12 to Guild Leaders and Guild Officials. As a regular guild member you only need to make sure your team is always active when the season is approaching. 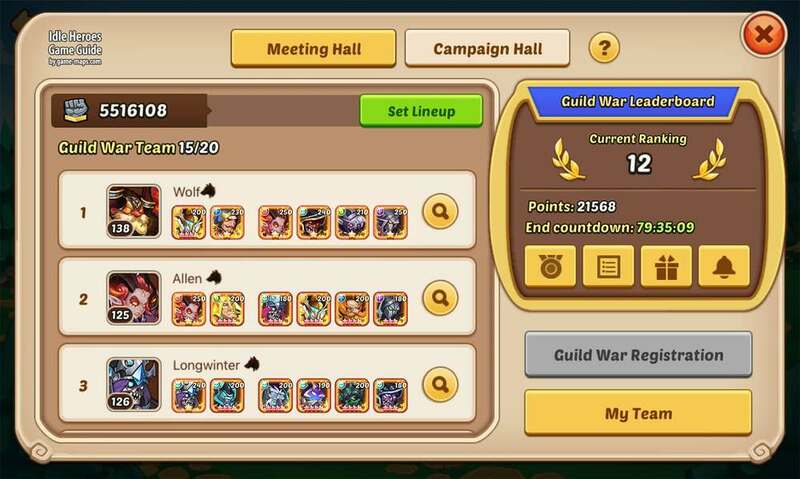 Use the "My Team" button to set your team to Guild War. Your team is remembered, so you need to update it every time you change something in it. Battles are conducted by Guild Leader or Guild Officials. If players leave their Guild during the Guild War they will not be able to obtain the Guild War prize and won't be able to participate in the current Guild War. Time: Monday 00:00- Friday 24:00(UTC/GMT 0). Registration: Guild master and officials sign your guild up to participate in Qualifying Round. Requirements: Guild level is required level 12 up. Battle teams of your guild should be between 10 to 15. Each guild member deploys one team. Guild master and officials can arrange the battle teams, including hiding three teams. Guild master and officials matchup the opponent in the Guild War battle hall, 10 seconds CD for each matchup. Each guild war battle consumes 1 battle energy, which is recovered every 3 hours. Each team can take part in guild war battle up to 3 times. During 1 round of guild war, victory team gains individual battle points. Guild that wins all the battles gain guild war points. Guilds are ranked based on their guild war points. The more battles your teams win and the more teams survive and the higher rank your guild has, then the more guild war points your guild earns. Ranking rewards are sent by in game mail. Top 16 guilds in Qualifying Round automatically enter the final. The system pairs up qualified guilds with an opponent basing on their ranking. Preparation time: Saturday 0:00 to 16:00; Competition time: Saturday 16:00 to 18:00. Ranking rewards will be sent by in game mail at the ending time of the Competition. In offseason players can check battle records of finals.